Bourne has a well-kept secret, well, maybe only from me. I heard about it when we had guests at our bed and breakfast who visited there. It is the National Marine Life Center, which is a hospital for marine animals and an education center. Located on Main Street in Buzzards Bay, the center’s mission is two-fold. The hospital is dedicated to rehabilitating stranded marine animals so that they can be released into their natural habitat. The Education Center is dedicated to advancing education about marine wildlife health and conservation; a worthy mission indeed. They work with our finned and flippered friends, the sea turtles, dolphins, seals, porpoises, and small whales. Bourne was chosen as the site for the hospital, where it draws salt water directly from the Cape Cod Canal. As the Cape is somewhat of a hotspot for the stranding of marine animals, the hospital receives animals from throughout the region. The NMLC was started in 1995 when a group of folks concerned about the stranding of marine life in the area gathered to discuss how to address the issue. It was through the efforts of people like Betsy and Townsend (known to many as Townie) Hornor that the hospital got its start. Both are now deceased but their legacy lives on. I consider it one of the great pleasures in my life that Charlie and I had the opportunity to meet Townie at his home in Osterville many years ago. 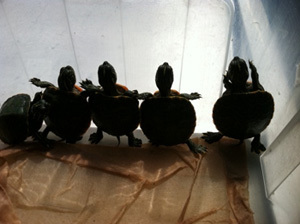 Each year the center receives Northern Red Bellied Cooter hatchlings. Unless you are from the south, you may not know what a cooter is. In the south it is a not-so-common nickname --and the name of my beloved cat-- but it is in fact a turtle. These little buddies are endangered and in the wild have a very high mortality rate. The Cooter hatchlings are about the size of a half dollar and are part of the state of Massachusetts “head start program.” The center raises the little Cooters until they are large enough to be released so that they will have a better chance to survive. An adult Northern Red Bellied Cooter will be about 10 to 12 inches in size and can weigh up to 10 pounds. 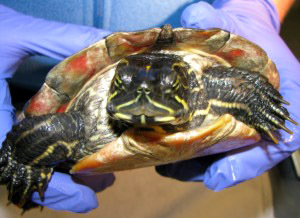 From the NMLC website you can follow the progress of Catch-22, a Red Bellied Cooter that has been at the center since May, 2010, being treated for a fungus-like growth on his shell. Read about this little fellow and why he came to live at the center and how he is progressing. If you have young kids, this is a great way to get them interested and involved in something that could lead to a life-long interest and possible vocation. The NMLC has a summer internship program, a volunteer program, and a membership program, all so vital to the functionality of any non-profit. Throughout the year, events such as their signature “Mermaid Ball” and the Annual Douglass J Fletcher Memorial Golf Tournament provide funds for the center. Please take time to look at their website or, better yet, go for a visit. Become a member and a volunteer. Make a donation or attend a fundraiser. You will be glad you did. A big, hearty salute to Kathy Zagzebski and all the folks at the National Marine Life Center who give so much for such a great cause.